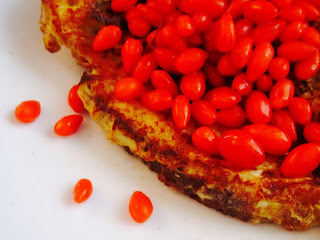 Wolfberries are the subject of today's post. Fresh ones. 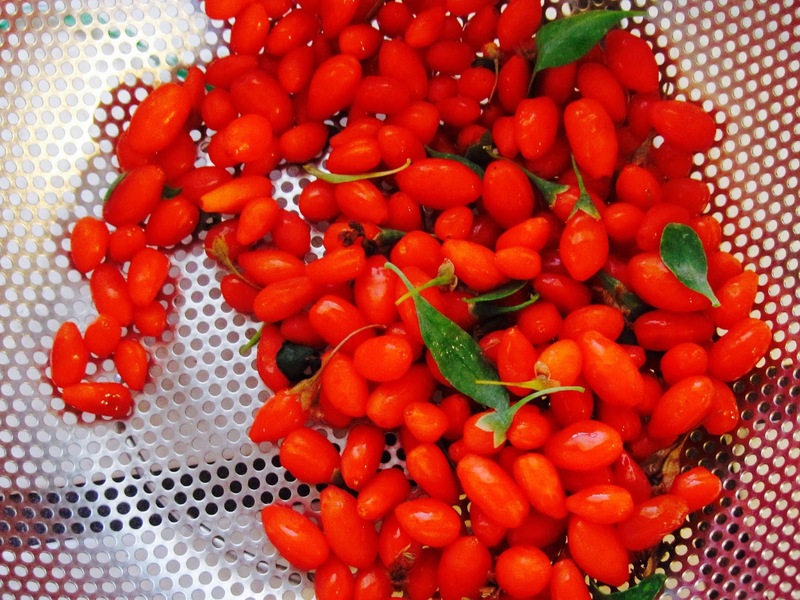 I'm probably way ahead of the curve here, as outside of my few secret sources, I've only seen them on our shores dried, when they are uniformly referred to as "goji berries." 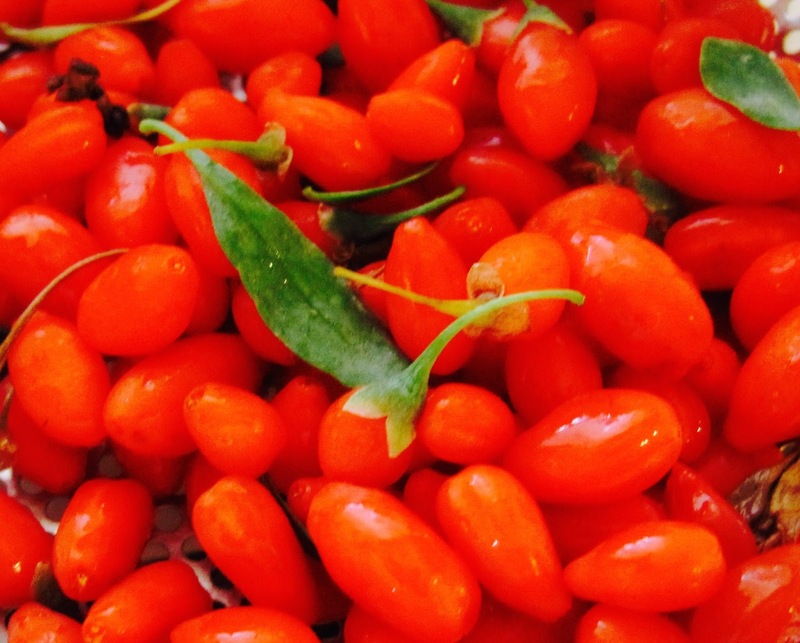 However, goji is their Japanese name, and since they are actually grown in China, it seems only fair that they should be more properly referred to as gǒuqǐ 枸杞. Raised mainly in the desert province of Ningxia Hui up near Mongolia and out in Xinjiang near the western borderlands with Central Asia, gouqi are regarded as veritable elixirs of good health in Chinese medicine and are often combined with other herbal ingredients to provide a touch of sweetness and flavor to the mix. But as good as those dried ones are, nothing beats a fresh wolfberry. These look and taste completely different from their dried compatriots - sort of the way in which a fresh, juicy grape seems totally unrelated to a raisin. A very thin skin covers a pulpy fruit filled with a spatter of really tiny seeds. Think of a Roma tomato reduced to the size of pine nut. 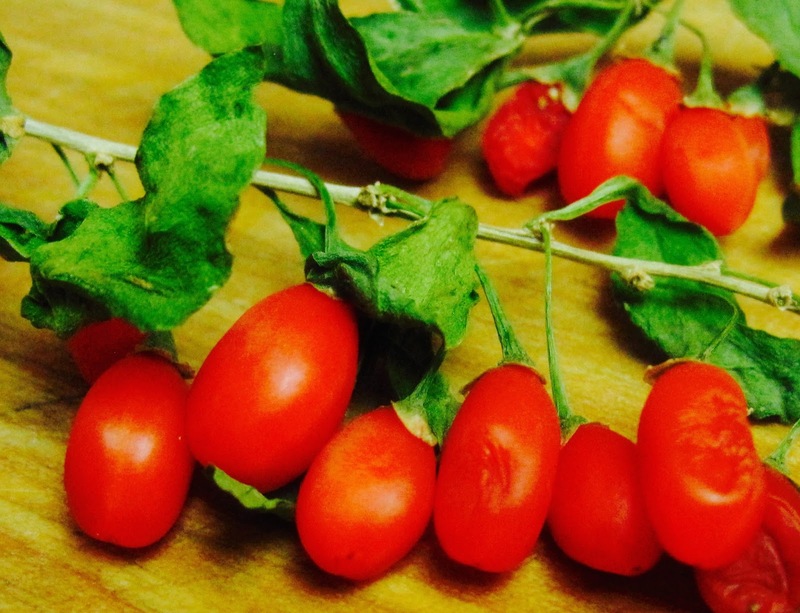 And that makes a whole lot of sense, as like the tomato this is a member of the nightshade family. But unlike a tomato, these are deliciously sweet with a flavor unlike any other fruit I've ever tried. Lightly fragrant, they pop in your mouth and release all their juices with the gentlest pressure. My friend Chiaying Fong was celebrating her bumper crop the other day and gave me a lovely basketful of these transient fall treasures. I was stunned at her generosity and happily accepted this amazing gift. They found their way onto morning waffles with just some butter nestled underneath them, and the results were astoundingly good. So, what to do until that fine day when we can at the very least hunt them down in a farmer's market? I did just that a couple of years ago and now have some lovely berries of my own growing on the big, leafy bushes that go well with just about any planting scheme. 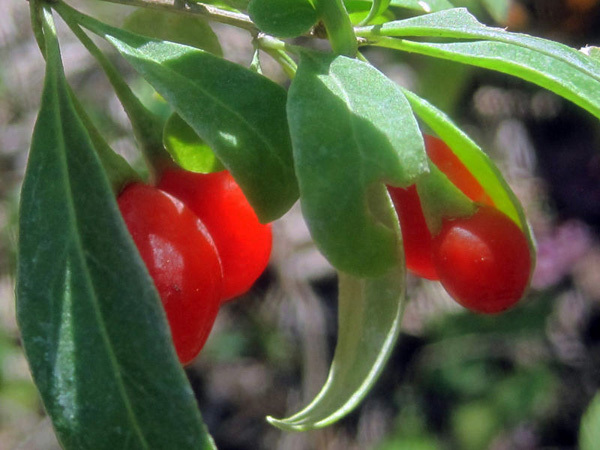 The berries hang down from the arching stems like little rubies, and they are ready when they turn bright scarlet. 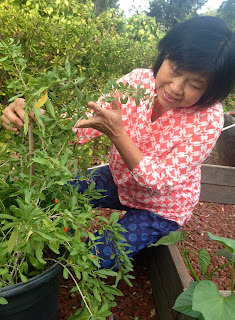 To make your very own gouqi plantation, just strip the leaves off of the base of some 2-inch stems with a few leaves left growing on the top, stick them into some rooting medium like Perlite or a loose potting soil, keep them watered, and soon you'll have a whole bunch of these fabulous plants. If you have the patience, you can also try growing them from seed - I'd suggest soaking a couple of the little fruits in warm water (preferably organic and nicely soft, so that they are of the best quality) until plump, and then you can carefully squeeze or scoop out the seedy pulp. You might even want to chill the dried seeds for a couple of months in the refrigerator to help fool them into thinking that winter has come and gone, and then sow them in light potting soil once the weather warms. Little purple blossoms of Lycium barbarum cover the branches before they set fruit, so there's this gorgeous progression of colors. The thin leaves drop off in winter, which is an excellent time to trim them up a bit so that they bush out with abandon in spring. Pot up the trimmings and make more plants and friends that way - at least, that's my suggestion. 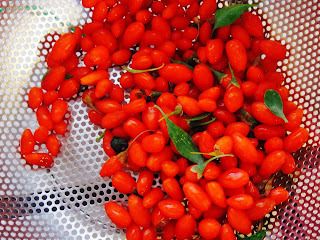 Do note that there is another type of wolfberry that you can get in Chinese grocery stores from summer up until frost: One with a wider leaf that is grown mainly for its tender leaves (gǒuqǐyè 枸杞葉, or Lycium chinense), although I've heard that its fruits can be just as good as L. barbarum. Of course, there's absolutely nothing stopping you from rooting these stems, and nothing gets wasted that way, either. These are leaves are really easy to use: just strip the leaves off of the stems, soak them in ice water for an hour or so to freshen them up and remove some of the bitterness, and then use in stir-fries or soups like any other leafy vegetable, where they should be added at the last minute to preserve their color and texture. To prepare fresh wolfberries, simply pull off any stems still sticking into the fruit, rinse in a colander, and shake dry. If you plan to hold the little fruits for a day or two in the fridge, then store them dry in a plastic bag, as water will make them rot faster. Wolfberries can be used much like any other fragile, ripe berry, but keep in mind that they are not as sharply sweet as, say, raspberries or blackberries, nor as highly flavorful as tomatoes. That - and their tiny seeds - is why they never appear in pies or get turned into sauces. Instead, the traditional Chinese way of cooking them is limited to adding the ripe fruits to austere stir-fries, especially things like celery, lily bulbs, and wolfberry leaves, where they won't be overwhelmed by other flavors and textures. That being said, 99% of the time you are only going to be able to get your hands on the dried berries. But keep your eyes out for Chinese friends with prolific wolfberry patches growing in their back yards. Ask for a taste of those fresh gouqi fruits and then get a couple of cuttings. Growing impossible-to-find produce is one of the best reasons to have a yard, in my personal opinion! Alas, until you have your own stellar crop waiting for you on the counter, you'll have to settle for dried berries, which really are quite tasty, of course. 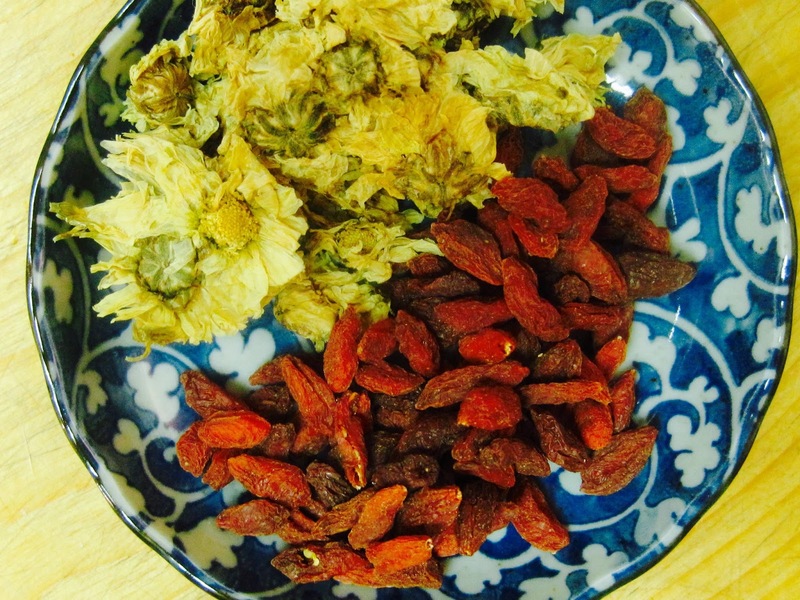 Here's a good way to turn those dried fruits into a tonic that is fabulous either hot or cold. 1. Place the wolfberries and chrysanthemums in a fine sieve and rinse them with some boiling water to remove any dust. Place the doused ingredients into a teapot. 2. Fill the pot with water that has come to a full boil and then rested for about 5 minutes, which will reduce the temperature a bit and so help preserve the flavors. Cover the pot and let the two ingredients seep for another 5 minutes or so, until the berries and flowers are plump. Add honey to taste, if you like. You can add water to the pot probably one more time before the flavor peters out. Do note that you can adjust the ratios of the berries and blossoms here as you like. Or, just leave out one or the other. It will taste good no matter what you do.